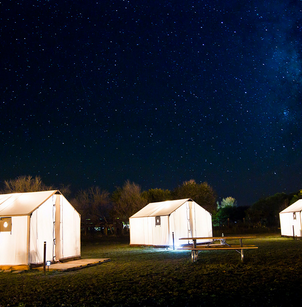 Join me for five days and four nights in the far out (literally and figuratively) Marfa, Texas. During our time out West, we’ll experience how connecting to wide open spaces, starry skies, and the beauty of art helps us connect more to what’s already inside us. We will be staying at a glamping boutique hotel with a variety of unique and instagrammable accommodations . Enjoy daily yoga and meditation, evenings under the stars, world-class art exhibits, and--most importantly--relax and have fun! Your $300 non-refundable deposit secures your spot (note: if you are sharing accommodations, each person must still put down a deposit to secure the reservation). Payment plans are available, see the FAQ section on this page for details. About a seven hour drive from the Austin area, Marfa feels a world away. An old ranching town, Marfa has become a hub for artists and creatives from everywhere in recent decades. This has made for an interesting blend of cultures and experiences you can’t have anywhere else. Its remote location, breathtaking landscapes, and unreliable cell service force you to disconnect from devices and reconnect to yourself and your surroundings. 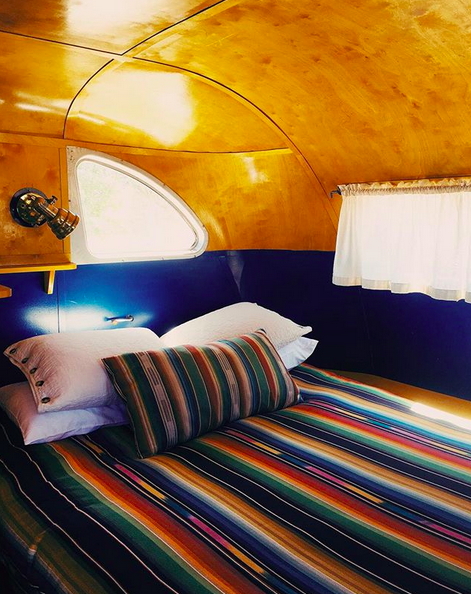 El Cosmico is a 21 acre nomadic hotel and campground in Marfa, Texas. Accommodations include renovated vintage trailers, safari tents, Sioux-style tepees, and Mongolian yurts. The property also offers several communal spaces, including a hammock grove, an outdoor kitchen and dining area, a community lounge and mercantile, and an outdoor stage where we will be doing yoga. They also offer wood-fired hot tubs (as the burn ban allows) and bike rentals for exploring Marfa. I came to my yoga practice shortly after getting sober in 2009. Yoga and meditation have completely transformed my life. I did my 200 hour Vinyasa/Power Yoga Teacher Training in 2014, and I am continuing my education this summer with a 200 hour cYoga training with my teachers, Carmen and Moises Aguilar. I have also studied trauma informed yoga through the Prison Yoga Project. In 2017, I opened my own yoga studio, Body + Shine Wellness, in Elgin, Texas, (about 20 miles east of Austin). In 2018, we were honored to be one of four finalists for the Best Downtown Business in Texas by the Texas Downtown Association. My goal is to give people tools to help them grow both on and off their mats. Each safari tent is 120 square feet and has wood floors and durable canvas walls and doors. Safari tents come equipped with queen beds, a chair, simple lighting and an electrical outlet for charging devices. Linens and towels for use at the adjacent shared bath house are provided. Each 22-foot diameter tepee has brick floors and offers a queen bed with heated mattress pad, love seat, and small daybed. It also features lighting and an electrical outlet for charging devices. Linens and towels for use at the nearby shared bath house are provided. ALL TEEPEES ARE CURRENTLY BOOKED. 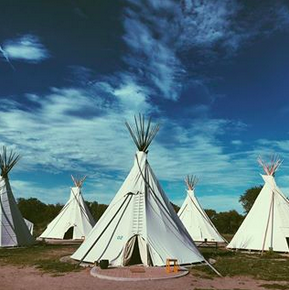 If you would like to be added to a wait list for a teepee, you can email katydoesyoga@gmail.com. I’d recommend booking your second choice in the meantime in case there are no cancellations. In case of a cancellation, we can switch your accommodations and apply any payments you’ve already made. Each 22-foot diameter yurt has wood floors and offers a queen bed, writing desk and sofa for lounging, as well as lighting and an electrical outlet for charging devices. It also features A/C and heat. Linens and towels for use at the nearby shared bath house are provided. ALL YURTS ARE CURRENTLY BOOKED. If you would like to be added to a wait list for a yurt, you can email katydoesyoga@gmail.com. I’d recommend booking your second choice in the meantime in case there are no cancellations. In case of a cancellation, we can switch your accommodations and apply any payments you’ve already made. Vagabond. Kozy Coach. Imperial Mansion. An armada afloat on a vast sea of desert. These trailers from the heyday of nomadic recreation have been restored with marine-varnished birch interiors, furnishings collected from around the world, and amenities for a comfortable camp experience. Each trailer has a unique combination of cooking, dining, sleeping, bathing and recreational features and comes equipped with AC and heater, refrigeration, basic cooking supplies and a radio with wireless iPod connectivity. All trailers come stocked with a dry goods minibar that includes some favorite items to camp with, cook with, keep you hydrated, caffeinated, and fill the need of salty, sweet and spicy cravings you are bound to have in the high dessert. Also included you will find items to cure your desert hangover, wash your dirty body, and light your evening hang out session around the nearest picnic table. Robes, bath towels and locally-made shampoo and conditioner are provided. Wireless internet does not reach the trailers by intention – wifi is available in the lobby and most common areas. A cozy place to lay your head. A Small Trailer is 11- 13 feet long and includes a full bed, kitchenette, a shared outdoor bath, a shared cedar deck, and an AC / heater. Communal spaces including a hammock grove, outdoor kitchen, dining area, and reading room are available to all guests. Shower under the stars. A Medium Trailer features a full or queen bed, indoor bathroom, outdoor shower or bathtub, AC/heater, and cedar deck at 24-27 feet long. The medium trailers that were placed on hold for our group have been booked, however El Cosmico may have additional medium trailers available. If you are interested in this option, please contact katydoesyoga@gmail.com before booking. Roam in slightly more space. From 24-34 feet long, a Large Trailer includes a queen bed, indoor bathroom, outdoor shower, AC/heater, and cedar deck. One Large Trailer is ADA accessible. Please contact katydoesyoga@gmail.com to confirm availability if you have ADA requirements. The largest and most imperial of all. 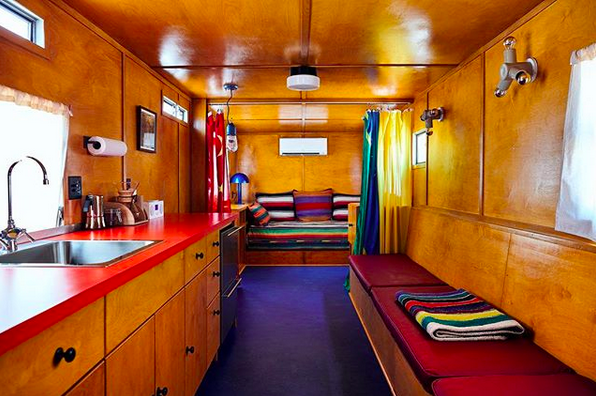 At 31-42 feet long, it boasts a king with an additional twin bed, indoor bathroom and shower, AC/heater, and cedar deck. The XL trailers that were placed on hold for our group have been booked, however El Cosmico may have additional XL trailers available. If you are interested in this option, please contact katydoesyoga@gmail.com before booking. Additional group excursions, such as Prada Marfa and the Marfa Lights lookout, or mountain hike—these excursions will be decided based on participant interest. Each retreat guest will also receive a goodie bag from our generous retreat sponsors! Transportation to Marfa. If you would like to caravan from Austin/Elgin together on Thursday, more details will be given as the retreat approaches. If you would like to carpool and share the cost of gas with other participants, I can help group together those interested. If you are coming from elsewhere, there is the option to fly to El Paso and drive around 3 hours to Marfa from there. Most meals. The eclectic nature of Marfa invites exploration—we encourage you to venture out around town and try what appeals to you, whether it’s upscale fine dining or a hole-in-the wall. Upon arrival, you will be given a list with ideas and recommendations. TBA! Working on some things…likely some sort of mountain/outdoor experience. May be also be a free day to do as you please. Will do yoga and meditation at some point. Yes! After you put down your deposit, I will email you to ask whether you would like to pay the rest in full or if you'd like to opt for a payment plan. For the payment plan, half the remaining balance is due March 1, and the other half of the remaining balance is due May 1. For those who have booked “shared” room types but have not yet found a roommate, if your roommate has not booked by April 1, your accommodation type will be switched to “private,” and your last payment will include the difference in pricing. Your credit card on file will be charged automatically on those dates—if you need to use a different payment method, please contact me before the payment dates. If I am sharing accommodations, does the person I'm sharing with need to put down a deposit, too? Yes. Each participant, whether they are sharing accommodation or not, will need to put down a deposit to secure their spot. Are men able to come to this retreat? Do I have to be an advanced yogi or teacher to participate? Everyone is welcome! All ages, genders, and experience levels are encouraged to join us. Yoga classes will be all levels, and we are always able to provide modifications if desired. Yes! There will not be mats available to borrow on site. Also be sure to bring any props you use in your practice, such as blocks, straps, blankets, etc. I am vegetarian/vegan/gluten free/etc., will the included meals accommodate my needs? Yes, I will ask upon registration if you have dietary restrictions or allergies, and I will make sure your needs are met. Common areas and certain accommodations have free WiFi available. Both cellular and WiFi signals are unreliable around Marfa in general. Use it as an excuse to disconnect and be present. As the retreat approaches, I will send out details for those who would like to caravan together from Elgin or Austin. If you are open to carpooling with others (in your vehicle or someone else’s), I will try to connect those who would like to do that! Save gas and make friends :) If you are coming from out of state, the closest airport is El Paso. You will need to rent a car upon arrival and it is about a three hour drive from there. Do I need to pay in full by the early bird deadline to receive the discount? Nope! As long as you put your deposit down by the early bird deadline (February 15), you lock in your rate. We will be very sad if you can't make it! The $300 deposit is non-refundable. If registration is cancelled after March 1, but before May 1, 80% of the amount paid (minus the deposit), will be refunded. If cancelled on or after May 1, 50% of the amount paid (minus the deposit), will be refunded.